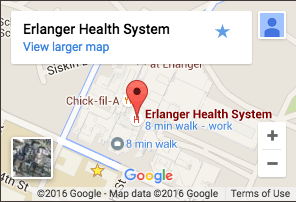 Erlanger is equipped with the latest ECMO (Extracorporeal Membrane Oxygenation) life support machines. Is used for patients suffering from acute, reversible, respiratory and/or cardiac failure. Is a short-term, support system that replaces or supplements the natural function of the heart and/or lungs, allowing them time to rest and potentially recover. Provides valuable time to further assess and treat the underlying cause of the acute problem. ECMO, although not a cure, may be a life-saving measure for patients with severe pulmonary and/or cardiac injury that is not responsive to standard forms of treatment, including mechanical ventilation and medications. Patients with severe congestive heart failure may also be candidates for ECMO as a bridge to recovery, mechanical support (ventricular assist device) or transplantation. Even though ECMO is not a treatment, it provides immediate hemodynamic support and oxygenation to tissues. By doing so, ECMO can provide time needed to allow the heart and lungs to recover and prevent ongoing organ injury during this time. The length of time a patient remains on ECMO varies and depends on the diagnosis and the individual’s capacity for recovery.